The ASCB’s E.E. Just Award comes with a medal, a named lecture, and a two-edged message for minority scientists today, according to this year’s winner, Daniel Cólon-Ramos of the Yale School of Medicine. The lecture is in honor of Ernest Everett Just, an early 20th century African-American scholar who, against all odds and the crushing racial prejudice of his day, made key discoveries in the emerging science of cell biology. 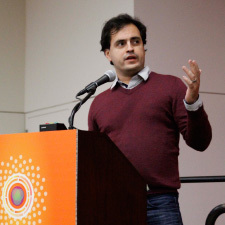 Speaking in San Francisco at ASCB 2016, Cólon-Ramos said that after being selected for the Just award, he looked into the namesake’s life and was struck both by Just’s academic achievements as a member of what is now called an underrepresented minority (URM) in science and Just’s insistence on being defined, first and foremost, as a scientific researcher. Then and now, this is the “sinister” side of being a minority scientist, said Cólon-Ramos. Sometimes you are known by your URM identity first and as a scientist second. Cólon-Ramos said that Just made significant discoveries at a critical moment in cell biology about the role of extracellular context yet his research has been overshadowed by Just’s virtually unique status at the time as an African-American, PhD-trained biology professor. At Yale, Cólon-Ramos holds a joint appointment in Cell Biology and in Neuroscience. “My interest is in understanding the cell biology of synapses at two levels. One of them is how synapses are established during development, that is, how are they built to sustain the architecture that allows us to understand the world around us, to be able to form memories? How are they able to process physical information as perceptions?” To get at the cell biology, the Cólon-Ramos lab uses the worm Caenorhabditis elegans as its model organism, because so much is known about its genetics, its developmental pathways, and even its complete connectome. Yet so little is known about a basic element of C. elegans neuroscience—how its synapses form or change. Only in the last minutes of his lecture did Cólon-Ramos return to E.E. Just. Cólon-Ramos said that in the early years of the 20th century, Just’s most supportive mentors advised him to forgo scientific discovery and concentrate instead on training future generations of URM scientists at Howard University. Just would not settle for that. “Many of his friends told him, why are you making your life so difficult? Go back to Howard and teach,” said Cólon-Ramos. Yet Just spent every summer at the Marine Biological Laboratory in Woods Hole, MA, and later at research stations in Italy and Germany, running experiments and writing papers. His published results laid out fundamental insights into the effects of the extracellular environment on cells, according to Cólon-Ramos. Most cell biologists of Just’s time were fascinated by the cell nucleus, where new staining techniques had made the chromosomes visible for the first time. Just studied the outer cell membrane, working with living cells as they divided and exploring the influence of their context in extracellular space. It would be the early 21st century before cell biologists began to realize what Just had seen in the early 20th century—that extracellular context was a powerful force in development and in disease. Coming from Puerto Rico where there were so many glaring social needs, Cólon-Ramos recalled, “Frankly I felt I was being egotistical in my pursuit of science because I thought I could better serve my community in other ways. It needed doctors, educators, and leaders in certain areas.” Being a research scientist today, Cólon-Ramos realizes that there are many ways of having an impact on communities. A URM scientist can have an effect beyond a single career or even an individual life. “I’m not just talking about the people here. I’m talking about people who haven’t been born yet,” he said. Science needs people like you, said Cólon-Ramos, much like science needed E.E. Just. 1Colón-Ramos DA (2016). The need to connect: on the cell biology of synapses, behaviors, and networks in science. Mol. Biol. Cell 21, 3197–3201. 2Shao Z, Watanabe S, Christensen R, Jorgensen EM, Colón-Ramos DA (2013). Synapse location during growth depends on glia location. Cell 154, 337–350. 3Luo L, Cook N, Venkatachalam V, Martinez-Velazquez LA, Zhang X, Calvo AC, Hawk J, MacInnis BL, Frank M, Ng JH, et al. (2014). Bidirectional thermotaxis in Caenorhabditis elegans is mediated by distinct sensorimotor strategies driven by the AFD thermosensory neurons. Proc Natl Acad Sci USA 111, 2776–2781.